Just as John Redfern began as a mercer, the Doucet family's business began in fabric and lace. In 1841, La Mode described the Doucets (then at 17 rue de la Paix) has having a "numerous and noble clientele", highly stylish in late spring for "trousseaus and corbeilles" - the corbeille being the gift of material wealth given to a woman by her husband the morning after the wedding, a continuance of the medieval Morgengabe - and was frequently recommended for fine lace for ruffles, berthas, and skirt flounces. The business was split by 1862 into two parts, both housed at 21 rue de la Paix: Mme Doucet was a lingère, selling women's chemises, drawers, caps, and other linen and cotton articles, while her son Edouard was listed as a tailleur-chemisier, selling men's underwear and outerwear, and marked a "notable business". (Quite a few other Doucets were in the luxury and clothing market - they may or may not have been related.) The premises were shared with a skirt (or petticoat) maker, a pair of seamstresses, and a court lawyer. By the 1870s, the shop was also listed as among the best for linens and gloves, not yet able to or perhaps not attempting to match the houses of Worth and Pingat. 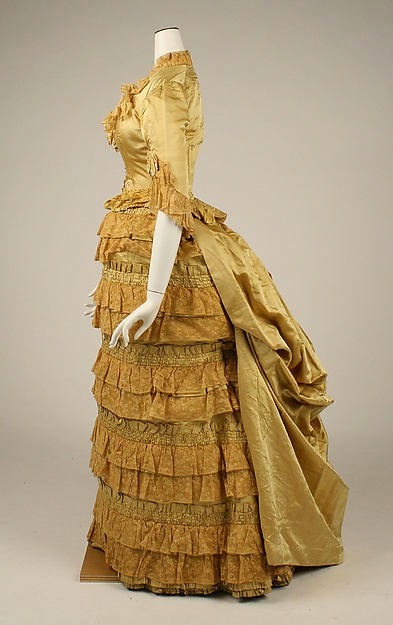 According to Jeanne Philomène Laperche, Edouard Doucet's reputation in women's dress was first made in the early 1870s (his earliest extant gown is from around 1878); he must have climbed during the 1880s, appearing from time to time in the French periodical L'Art et la mode, but it's not until the 1890s that I can find him listed with Worth and Felix (another couturier commonly listed as one of the best; someday I will write him up). 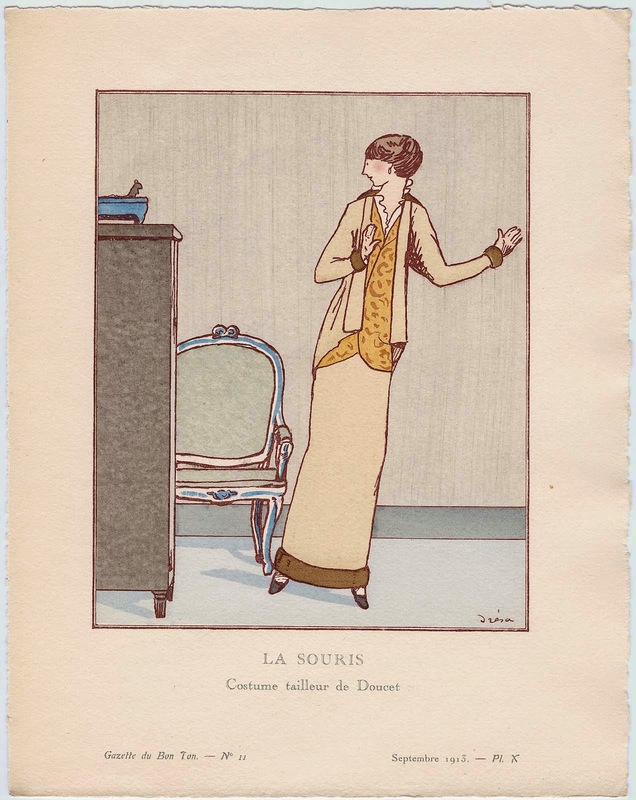 At this time "Doucet skirt" (as well as "Paquin skirt") became a term used in dress construction, describing a skirt made on a gored silk foundation. There is, however, not much to suggest what effect Edouard Doucet may have had on fashion or what his taste was for - compare to John Redfern's sporting outfits or Pingat's austere elegance. He contributed to the historicism at the end of the nineteenth century, and it sounds as though he reliably produced attractive and well-made gowns (as well as lingerie). From extant examples, it seems unlikely that his background in tailoring was highly influential on his design sensibilities. When he died in 1898 The Sketch described him as "like Worth ... a Triton among the ruck of modish minnows" - although from the description of "Papa Doucet", he was much more personable and politic with his clients than Worth, convincing them that they were beautiful in the right clothing. It's important to remember Edouard - the vast majority of sources, including museums, present his son as the one Doucet couturier and the person who turned the family business from lace and silk to women's dress. They cite his son Jacques as the designer of outfits that were made before he was actually in charge of the house of Doucet. Jacques, the Doucet who is more well-known today, was active at the time in his own establishment. By 1877, at 24 years of age, Doucet jeune was recommended as a chemisier at 10 rue Halevy, just around the block from the elder Doucet's salon. While his father was alive, Jacques seems to have stayed in the rue Halevy and kept his focus on men's shirts, underclothing, and fabric accessories - and he may have been very successful, as he was even at that time known as an art collector; later he was a friend of the Impressionist painters. The establishment in the rue Halevy continued under the same name despite Jacques's lack of children, as in 1946 it still existed. Upon inheriting the business, Jacques did not allow it to sink, but kept it among the top "equally good" firms at the turn of the century. Sources are divided on whether Paul Poiret began working in the couture house in 1896 or 1898, but 1898 seems the most probable - meaning that he would have been hired by Jacques Doucet during his first few months as head of the business. When Poiret left for military service two years later, he had become the head of the tailoring department. Doucet's other famous protégée, Madeleine Vionnet, had worked at Callot Soeurs since 1900 and came to Doucet in 1907. As head designer, she was in a strong position to influence a house which itself was in a position to influence fashion, and it is generally accepted that she did so. In 1908, both Callot Soeurs and Doucet were singled out as bringing in a "return to Nature" with a Neoclassical revival (which, entertainingly, the magazine believed would not have much of an effect on fashion as a whole) - it seems likely that Vionnet was involved with this. Like Redfern, Jenny, and Chéruit, Doucet was also published in the Gazette du Bon Ton, that excessively expensive and exclusive publication. After being an early adopter of the slim Empire line, Doucet may have introduced or at least used some of the first hooped versions of the robe de style. Then in 1918, he was credited in a trade journal as designing a "sack dress", unbelted and unwaisted, "on the lines of a Japanese kimono". While his name does not have much cachet today, he was clearly at the forefront of his field - it's impossible to know who exactly came up with each of the various gradual changes that pushed fashion along its track, but that Jacques Doucet was designing in this way before these elements became standard does say something about his ability to either spot where fashion was going or influence its destination. Some sources give the tired old story told of many designers who are not Vionnet or Chanel, that the house of Doucet fell out of fashion in the 1920s because Jacques couldn't give up a luxurious and structured style of dress that no longer had a place in the postwar world. As usual, I disagree: 1920s fashion flowed naturally from late 1910s fashion, as the above left illustration shows, and Doucet was well able to keep pace with the changes, above right. Jacques Doucet was in his mid-70s, possibly in failing health given his death in 1929, and was most likely simply not up to the task anymore. Sources conflict as to whether Maison Doucet merged with Maison Doeuillet in 1928 or 1929 (1924 is a very early date given by only a few) - but a 1931 source states that "M. Doucet has recently died", which implies to me that he died after giving over his business: therefore, 1928 seems most likely. The 1931 source also speaks of Doeuillet in the past tense, so he had probably also died by that time, leaving Doeuillet-Doucet to be directed by a Georges Auber. It probably retained all of both houses' prestige, as a 1933 textile arts syllabus lists it after only Worth and Jenny under "noted designers". References to the house stop appearing in the early 1930s, so the amalgamation probably closed in 1934 or so. Until fairly recently, it was not common for fashion houses to continue under the same name with a new designer, unless it remained in the family - Redfern being an exception, but then, Charles Poynter had his name legally changed to Charles Poynter Redfern - and Jacques Doucet had no children. Given the timing, the merger may have been a last-ditch, desperate measure to keep afloat, but the fact that it occurred at all should not be taken as meaningful with regards to how women felt about their designs. It was a business transaction that gave Doeuillet (and Auber) the benefit of a second excellent reputation to add to his own and a new pool of experienced and adept workers to draw from; meanwhile it ensured that Doucet's name, one that had been in the industry through almost the entire 19th century, would continue after his death and allowed his clientele to expect the same service they were used to. The merger might have also given his widow needed money to live on. The Great Depression was extremely hard on the Paris fashion industry. I previously discussed this with regard to Chanel, listing the many houses that closed from 1929 on, but it can always be restated: the business world is not a pure meritocracy. Success can mean that a company makes a better product than its competitors, but it can also mean that it was better funded, ran more seductive advertising, had personal connections behind the scenes, or even that it used unethical practices. We cannot look at a successful fashion house as one that captured the zeitgeist more fully or created a standard others were unable to match, and we cannot look at shuttered fashion houses as ones that failed to make clothing women wanted to wear. Did Amazon and Barnes & Noble beat Borders because Borders didn't stock the right books? No. In fact, most of the problems had little to do with the products themselves. So Doeuillet-Doucet's closure in the early 1930s should not be interpreted as being meaningful about the state of their clothing. Rather, it should be seen as an example of how devastating the Depression was, that it could even kill a couture house with such a weight of history and two reputations behind it.